where he sat for the next hour getting his bearings. put weight back on and was settling back into his normal behavior patterns. feeding on the seed in the feed tray. recently received through DEC’s Environmental Community Grant. observations, the decision was made to remove the panel dividing them. getting back on and resuming feeding. introduced, Joy and Dawn can share food without any signs of aggression. bonding now should be good preparation for next year’s breeding season. Joy and Dawn’s first encounter at the food tray. Joy is the bird on the left. 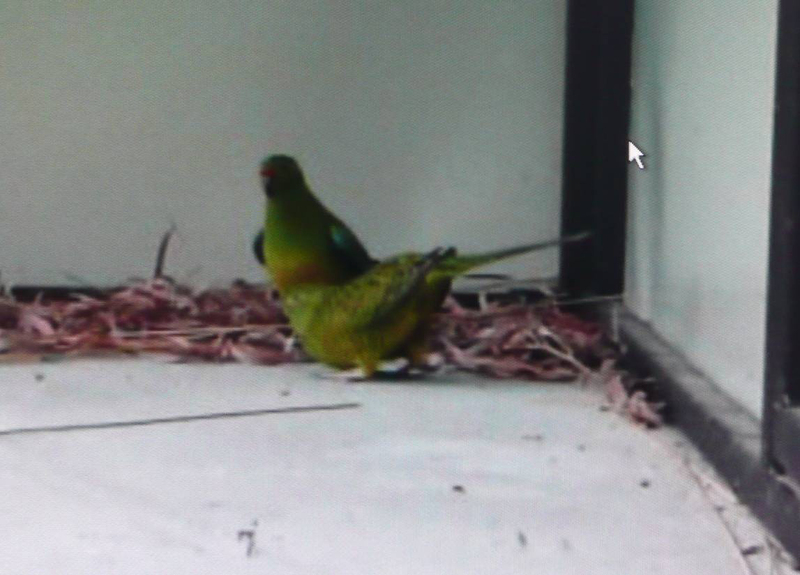 The additional funding from the Department of Environment and Conservation (DEC) has allowed the capture at three more Western Ground Parrots (WGPs) which will allow the Captive Management Project to progress to a trial of captive breeding. The aim was to capture at least two females and one male. This will bring the captive population to six birds and three potential pairs to trial breeding with. As with last year, juvenile birds were preferred because they settle into captivity more readily. On 12 November a team of DEC staff with WGP and capture expertise headed to Cape Arid to begin capture attempts. They were accompanied by volunteers from the Friends of the Western Ground Parrot. The Friends were recently successful in securing funding through DEC’s Environmental Community Grants and this covered volunteer travel and food expenses. At the captive facility, DEC’s Abby Berryman and Perth Zoo’s Matt Ricci were ready to receive and settle any new birds. This year appears to have been a good breeding season at Cape Arid. There has been a lot of calling activity and plenty of juvenile WGPs have been heard and seen. On the first morning of captures (17 Nov), four birds were caught. All were juveniles – three females and one male. It was decided to only take the male and one of the females because of the chance that the four birds were part of the same family. Because the captive population is so small, it is better to avoid having individuals that are too closely related. However, there are indications that birds of this age may form small flocks of young birds from different families but we won’t know how closely related these two birds are until genetic analysis is done. These two birds travelled really well on the trip back to the captive facility. Both of them fed on the trip so by the time they arrived they were slightly heavier than their capture weight. They were released into the aviary that afternoon and settled very quickly, with both finding the food tray by the following morning. They rapidly became familiar with the food tray set-up and looked very relaxed while feeding – so much so that in the first two days, Nellie (the female) put on 7 grams! The male bird (Fly) has also maintained a good weight. Another juvenile female was captured the following morning (18 Nov). She has been named Fang as she has is a feisty little bird who gives a rather painful bite. She didn’t eat on the trip back but was in good condition when she arrived. That afternoon she found the pile of native plant food and began feeding well and also made her first (albeit brief!) venture onto the food tray. By the following morning was looking very relaxed feeding on the native food as well as the seed on the food tray. Her weight is good and she looks very bright and active. The capture team will be in the field until 26 November and plan to keep trying to catch more WGPs for the captive project. (two males and a female) were caught, taking the total captive population to nine birds (four females and five males). The three newest birds settled in very quickly. Two of the birds (a male and a female) were put in an aviary together. Not long after release into the aviary they could be seen sitting side by side at the back of the aviary preening each other. A little over two hours later they were both on the food tray looking very relaxed and feeding together. This has been the fastest time yet that birds have taken to find the food tray. The other male that was captured on November 24 was put into an aviary with Nellie. Nellie had calmly walked away and hidden when we approached the aviary to release the new male. When the male was released he walked a few steps, sat and looked around for a moment and then did a short flight. The only problem was that he landed pretty much right on top of where Nellie had hidden which gave both birds a fright! Following this, they were both quite wary of each other for the rest of the day but by the following day they were beginning to relax. They now get on very well and are often seen feeding together. The male has been named Storm because of the way he introduced himself to Nellie. On December 9 an unfortunate decision was required to euthanase one of the birds (the second female captured this year, named Fang). She had badly broken her leg when she flew into the solid wall of the aviary and despite local vets spending a lot of time trying to stabilise the fracture, the leg could not be repaired successfully. Fang was a very flighty bird and she had never settled as well as the others- she still flushed every time the aviary was accessed to change the food and water. When the aviaries were prepared for the WGPs we put in a lot of effort erecting a shadecloth barrier inside the pen to screen the wire mesh to soften any impacts. It was thought that the birds were most at risk of injuring themselves against the wire as it wasn’t a visual barrier. The solid walls however are a very obvious barrier and we had assumed that a bird would try to avoid colliding with them. Fang however proved us wrong and in future we will soften all sides of the aviary to avoid a repeat occurrence. The remaining five new birds have settled very well into captivity and the risk of them injuring themselves like Fang did is minimal. They all readily accept human presence at feed time and rarely flush. If they do fly, the flights are very safe and controlled. Some of the birds will even sit up on top of the vegetation and watch Department of Environment and Conservation (DEC) staff members changing their food! The capture of the new Western Ground Parrots for the Captive Management Project would not have been possible without the combined effort of staff from DEC (five Regional and two Science Division staff), Perth Zoo and volunteers.. Eight volunteers contributed a total of 889 hours to the effort! Funding for the capture work was provided by State NRM. Thanks to all the staff and volunteers involved. were captured and samples were taken to test for disease. Results so far have come back negative and we are just waiting on one last test result. Provided the results are negative for disease then the birds will be cleared to come out of quarantine and will be shifted into the captive facility with the three established captive birds. Department of Environment and Conservation staff have been busy over the past few weeks putting the finishing touches on the new aviaries in preparation for the big move. Although the captive facility was completed in September last year, the aviaries that will be used to house the new birds still needed feeding platforms, shelters and video monitoring equipment to be installed. All of the captive WGPs are doing very well and look really settled. One of the new birds in particular has become so excited by the prospect of fresh food that he sometimes comes down to have a look before we are finished feeding. However, when he sees hands coming through the feeding hatch he retreats to a safe distance. It seems to be quite a dilemma for him whether eating the fresh food is more important than keeping his distance from humans. It is very pleasing to see that the birds have settled so well into captivity. When designing the aviaries, every effort was made to minimise human contact with the birds and to provide them with an environment that was as stress-free as possible. Birds that are relaxed and well-adjusted to captivity have a greater chance of breeding successfully. This month, the five newest additions to the captive population were cleared of quarantine after test results for disease came back negative. This meant that they could be moved into the main facility alongside the other three captive birds. The male bird (10M01) that was housed separately in quarantine was shifted first and rapidly settled into his new surroundings. Four hours after being released into his new aviary he had found the food tray and was busy eating. The following day, the remaining four birds were moved. One pair (10M04 and 10F01) that shared an aviary in quarantine were kept together. Although they didn’t come to the food tray until the following day, both were seen shortly after release exploring the aviary and sampling the live plants that grow within the aviary. The other pair that shared an aviary in quarantine were separated. 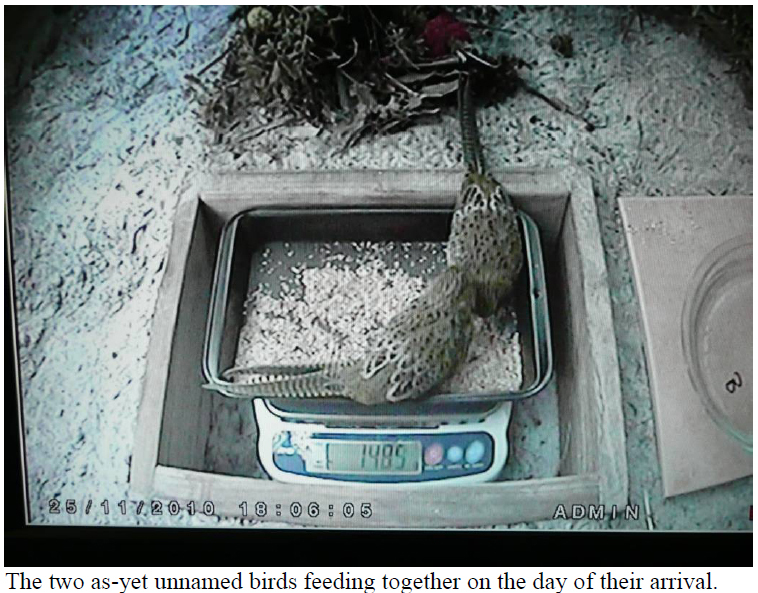 The male (10M03) settled rapidly and found the food tray 5.5 hours after release. The female (10F05) took longer to settle and didn’t make her way onto the food tray until three days after the move. During this time she was closely monitored and was regularly sighted looking bright and alert, moving around and foraging on the live plants and other food that had been scattered around the aviary. This female was placed in an aviary adjacent to one of the male birds captured in 2009 (09M01). Although genetic work has yet to be completed, it is thought that 09M01 is likely to be a better match as they were taken from sites approximately 20km apart. A section of wire mesh between the two aviaries provides the birds with an opportunity to see each other. Over coming months they will be monitored and if they show an interest the panel will be removed so that they can interact further. We don’t yet know the age that Western Ground Parrots are capable of breeding but it is considered unlikely that this pair will breed in the next year. Dear readers, I would like to draw your attention to the range of merchandise available to help support the Western Ground Parrot Recovery Project. I do not need to remind you how critical the situation is. It is unlikely that the Western Ground Parrot will be able to survive without our help, so this merchandise is a great way to show support. 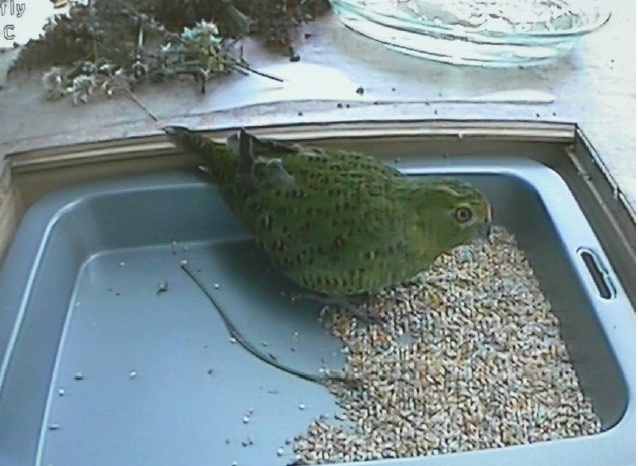 Funds raised through the sale of Western Ground Parrot merchandise will go to help save this bird. For example, survey equipment has been purchased including head torches, compasses and GPS's from funds raised. We have also been able to assist with equipment for the captive management program. Over 30% of the price you pay goes towards the recovery of the Western Ground Parrot. The wine comes as a well aged 2005 shiraz and 2004 touriga nationale. Though not a wine drinker, I have heard only favourable comments about this wine. These bottles make great gifts too. 2005 Shiraz – has a sophisticated, earthy and ripe, fresh strawberry bouquet reminiscent of a great pinot noir. Due to strict use of the European method of extended 2 week contact of the juice with the seeds, skins and stalks, rich fruit rather than pepper flavour is evident, which has perfectly integrated with oak following 60 months in rare Hungarian oak barrels. 2004 Touriga Nationale - this unique red wine made from the Portuguese grape, has matured for 6 years in French oak barrels. Extended contact of the juice with the skins and seed was allowed, according to the European method produce wine with a richer, more complex fruit flavour. This wine has a bouquet of dark plum and honey. Flavours of ripe, sweet cherry and chocolate persist on the palate. The wine order form is on our website (at very end of newsletter). If you are in Albany, wine can be purchased without paying the postage and also in smaller amounts than by the dozen. Contact Deon Utber by email atwgparrot@gmail.com. If you do not have the internet – contact Deon Utber (or Sarah Comer) at DEC Albany office; (08) 9842 4500. About 40% of the sticker price goes towards the recovery of the Western Ground Parrot. To buy one to 12 stickers, send a Stamped Addressed envelope with payment to committee member Val Hack, PO Box 654 Albany WA 6331. The stickers are 10 cm x 10 cm in size. Any cheque should be made out to Friends of the Western Ground Parrot. Val’s phone contact is 0409443331. They cost a dollar each. held to the old Poison Creek Track alignment, otherwise several other key ground parrot habitat areas along the Telegraph Track would have been threatened. Conditions were extreme, with wind direction and speeds extremely erratic and difficult to predict, and it is worth noting that keeping the total fire to such a relatively small size (Cape Arid sometime experiences wildfires of over 100 000 ha) was only due to the diligent efforts of the fire crews. 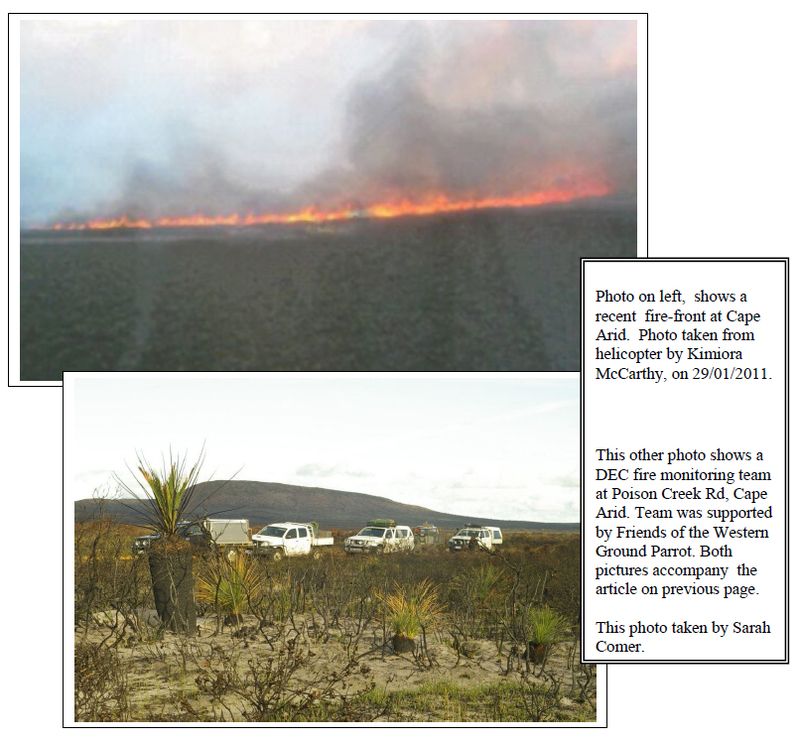 The habitat that was burnt, was known to have contained around 20 known western ground parrots and believed to have been an important area for breeding (this is where young birds were captured in 2009). A recent monitoring trip, led by DEC staff and supported by the Friends of the Western Ground Parrot, surveyed potential and previously occupied ground parrot habitat surrounding the burnt area. Volunteers came from as far away as the United Kingdom to help with the survey, and some were lucky enough to hear birds. The group also helped with monitoring native fauna populations, and tracking the feral cats that had been fitted with radio collars to determine the effectiveness of cat baiting efforts. discussed to use automated recording units to help cover some of the unsurveyed area, but future monitoring trips will also need to focus on areas to the north of the fire. Cat baiting of the area was conducted in March of this year as part of the integrated fauna recovery project, and a second ground baiting of tracks is currently being completed. It is hoped that this important predator control will provide extra protection to birds that may have been displaced by the bushfire. 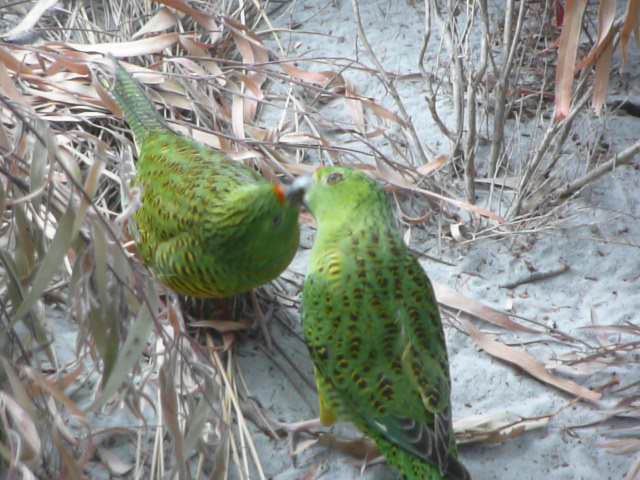 Winter is the time of year when Western Ground Parrots are preparing to breed in the wild, so the captive WGPs will be watched with great interest over the coming months to study their behaviour and social interactions. Of the three females, two are approaching one year of age. One of these females (10F01 – Nellie) shares an aviary with a male the same age (10M04 – Storm). The other female (10F05 - Fifi) is housed next door to the adult male (09M01 - Zephyr) – they can see each other and the dividing panel will be removed if she begins to show an interest in interacting with him. The third female, 09F04 (Dawn) shares an aviary with a male 09M04 (Joy). Both Joy and Dawn are nearly two years old. Earlier this month, Dawn was heard making a clucking noise (like she made last year when displaying to Joy) and both Joy and Dawn appeared to be quite excited, calling, running around and doing short flights. It wasn’t entirely clear what exactly was going on between them, but it was very interesting to see this activity. All seems to have gone quiet between Joy and Dawn at the moment but the birds are very good at being secretive and can be difficult to see within the aviary. All of the captive birds will continue to be observed over the next few months so that we can learn as much as possible about their behaviour and the way in which they interact with each other during the time when wild birds would be expected to be breeding. Over the past three months the captive Western Ground Parrots have continued to be maintained successfully with all birds in good condition. During August, a one year old female (10F01 – “Nellie”) was seen displaying to the one year old male (10M04 – “Storm”) that she is housed with in the aviaries. The display consists of her making a clucking noise as she raises her tail. The male however showed little interest and continued feeding. No further displays have been observed since. The two year old female (09F04 – “Dawn”) has also been observed giving this clucking display on numerous occasions since late June. Up until recently, the two year old male that she is paired with (09M04 – “Joy”) has either continued eating or backed off in response to this display. On 30 September the female’s weight began to increase despite an observed decrease in the number of visits she made to the food tray. In response, observations of this pair of birds were increased and on the 3rd of October the male was observed feeding the female. This is the first time this behaviour has been observed in captivity, and it is known to occur in natural circumstances during the breeding season. The following day another first was observed when the two year old pair were seen mating. As suspected, the clucking display is the female soliciting copulation and she has been recorded clucking throughout the mating occasions. Since the first observation of copulation, they have been observed mating on numerous occasions over a period of three weeks, often three or four times in a day. All of the mating that has been recorded has appeared to take place at the front of the aviary where we have a surveillance camera set up to record this activity. By 17 October the mating activity seemed to be decreasing and the female was seen infrequently during the day. 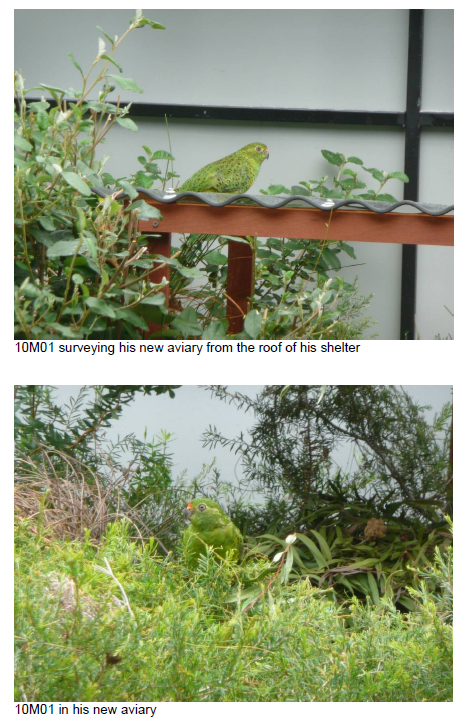 It is possible that she may be nesting at the rear of the aviary hidden away from view and out of sight of the cameras. A camera will be placed at the back of the aviary to monitor the activity there, but only if the opportunity presents to do this with a minimum of disturbance to the bird(s). Dawn (front) in her clucking display posture. Joy stands very upright when he approaches her, lifts his feet high as he walks and holds his wings away from this body so that the aqua blue colour at the front of the wing is displayed. observed mating since the 4th of October. would have had direct sunlight into it at times during the day. of losing chicks to heat will be progressed. four eggs from this clutch to have been viable is promising. their flight and tail feathers and many of their body feathers. to keep showering by brushing against the wet vegetation. One of the females (Nellie – 10F01) is particularly accepting of aviary entries. being unlocked she doesn’t panic but quietly walks to the rear of the aviary. the aviary to feed within minutes of the aviary being exited.